The aim of this study was to compare early wound healing, tooth staining and patient acceptance with two different post-surgical maintenance protocols. Forty patients scheduled for flap surgery to treat periodontal pockets or accommodate dental implants were randomly assigned to receive the following two different post-surgical maintenance protocols: (a) 2 weeks rinsing with a 0.05 % chlorhexidine digluconate (CHX)/herbal extract combination (test) or (b) a 0.1 % CHX solution (control). Early wound healing was evaluated clinically and immunologically. Tooth staining and patient acceptance were assessed by means of visual analogue scale (VAS). Both groups presented with comparable wound healing profiles. No statistically significant differences were observed between the two protocols regarding early wound healing and plaque index (p > 0.05). 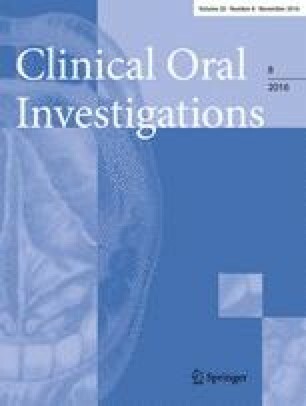 However, in the control group, statistically significantly more patients felt discomfort due to tooth staining (p = 0.0467). Compared with patients from the test group, patients in the control group reported statistically significant more irritation of taste at week 1 (p = 0.0359) and at week 2 (p = 0.0042). The present findings indicate that the two CHX protocols resulted in comparable healing and inhibition of plaque formation. Tooth staining and subjective discomfort related to irritation of taste were more frequent in the control group. A post-operative protocol including 0.05 % CHX/herbal extract may have the potential to improve patient compliance during post-operative maintenance. The laboratory work performed by Mrs. Marianne Weibel is highly appreciated. The collaborations of Mario Bassetti, Aleksandar Ivanovic and Pascale Stadelmann are also acknowledged. This study was approved by the Swiss Agency for Therapeutic Products (Swissmedic) and the Ethical Committee of the Canton of Bern, Switzerland (KEK 151/10 UB 12-147). GCP guidelines were strictly followed. All authors declare that they have no conflict of interest related to this study. The present study was funded by Tentan AG, Switzerland. The patients screened and included in the study gave written informed consent, approved by the Ethical Committee of the Canton of Bern, Switzerland (KEK 151/10 UB 12-147).